Get a good broker, make time for lunch and leave expensive shoes at home advises Ducote. Illustration by Natasha Law. 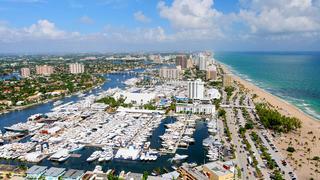 The Fort Lauderdale International Boat Show is one of the main events in the yachting calendar. Consider a yacht broker the Disney FastPass+ of boat shows. A broker will make appointments beforehand, so you’ll be expected and welcomed aboard. The last thing you want is to be stuck on the dock in the sun, hoping to board a popular yacht. A good broker will send you options and floor plans ahead of time to narrow down the boats you’re most interested in. You won’t have enough time to see everything, so make your time count. Don’t drag your lady on a 27ft Intrepid when what you’re really interested in is a 90ft express. My husband never misses a meal, unless he’s at a boat show and then all bets are off. I’ve lost my lid many a time by late afternoon, demanding to be fed. Make sure you plan lunch into your schedule of showings. Unless you have a friend with a waterfront house who will tender you to the show, expect a parking nightmare. Don’t even blink at $50 or $100 for the closest lot. Your lady’s feet will thank you. Make dinner reservations far in advance or you’ll suffer hour-plus wait times. For the Fort Lauderdale Boat Show, book one of these greats for each night: Grille 66, Lobster Bar Sea Grille, Valentino Cucina Italiana, and Canyon for its legendary Prickly Pear Margarita. Wear comfortable shoes that slip on. But leave your Chanel slides at home. You won’t want to leave $500 of fine leather on a crowded dock. Expect a command performance on the last day to see the show highlights, but slip away beforehand for some shopping. While in Fort Lauderdale, plan lunch at Neiman Marcus’s Mermaid Bar in the Galleria Mall and treat yourself to a Bubbly Bellini Pedicure at Casbah Spa. Hit the docks by 10am. The earlier you arrive, the less crowded it will be and the more boats you can see in the same amount of time. And lastly, avoid public toilets. Find a friend with a yacht at the show and prearrange to use their dayhead. A Port-O-Let in the heat is a fate worse than death. It’s true that the best laid plans of mice and men often go awry. And you may suddenly find yourself in the engine room of a Norwegian tug boat. But just refocus and get back on schedule. 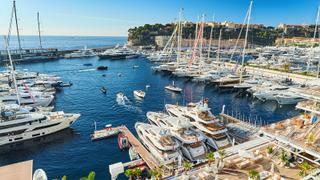 And always remember – while a new yacht may mean a few less alligator Hermès bags, a yacht goes with everything!